French physiologist Bernard said: “The constant condition of the internal environment is the basic quality to life.” It means although the external environment of a body is constantly changing so long as to maintain a constant internal environment, all organisms can live freely and normally. Therefore, the constant condition of the internal environment is the necessary quality to ensure the vitality of the human body. Once the internal environment occurs abnormally disordered, it may then lead to disorder to a certain organ. Therefore, a series of pathological changes may come and threaten the life. Water, contents the most in a human body, and takes about 60-70% of the body weight. A variety of chemical reactions is carried out in the water this is because every substance involved in metabolic changes and catalytic enzymes involved in catalytic metabolic changes may only react largely when molecules or ions is dispersed in water. A variety of nutritional substances may dissolve in water under the catalysis of the enzyme and transport the nutrition through the blood to nourish the entire body. Then finally, body fluid is constituted. There are two types of body fluid: Sub-cellular body fluid and extra-cellular fluid. All cells in the human body are immersed in the extra-cellular fluid and the activities of cells are also carried through in the environment. 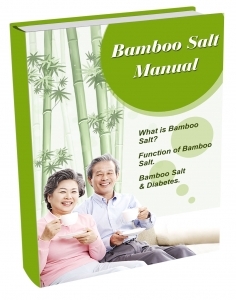 How is bamboo salt made?